← There is more than ONE kind of tortilla?!?! It’s hot out. Well, all things considered not THAT hot. It’s not Death Valley hot. It’s not even El Cajon hot. Ok it’s just kind of warm and I don’t have a/c in my house. And there was no way my oven was going on, but the grill? Yes, the grill! I had some salmon fillets that I picked up at the store that needed to be cooked. (Fresh and Easy is carrying wild caught, skin on, never frozen pacific salmon. I couldn’t resist!) So I fired up that grill, and made a quick marinade for the salmon. Soy sauce, garlic, chili bean paste, and agave syrup does wonders for a fillet! But this post is not about the salmon. It’s about what happened before the salmon. My mind wandered, I was hungry, normally danger would ensue. (Read a bag of chips and salsa). 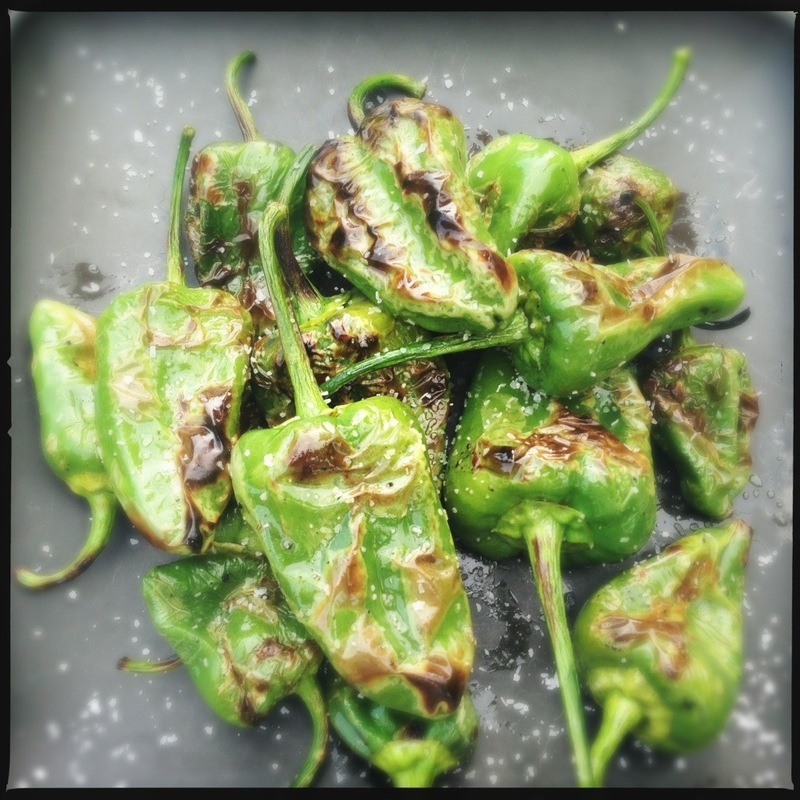 My eyes spied the garden and padron peppers and I had a far far superior plan! After washing the peppers up, I dried them off and tossed them with olive oil. Right on the grill, padrons cook up quick. Turn them until the are blistered, 4-5 minutes tops, and then sprinkle with sea or kosher salt once they are on a plate. Padrons are great Spanish pepper variety. Picked around 1-1.5″ long they are very mild, but some of them pack a punch. It’s like pepper Russian roulette. I love them! Way better then the inferior shishto variety that seem to be languishing in my garden. If you don’t have a grill, pan fry them, but either way – buy these at the store, plant a plant, and eat them! Yum! Much better than boring ole chips and salsa! Send some my way!